According to TMZ, Khloe practically picked out one of everything from the store - mostly in shades of pink. Allegedly among the mother-to-be's items of choice are a $10,000 crib, a Versace baby blanket worth $365 and a matching $600 Versace changing bag. Determined that her child will be as stylish as her older sister Kim and Kourtney's kids, Khloe also chose a Givenchy Kids leather jacket for a mere $1,450. 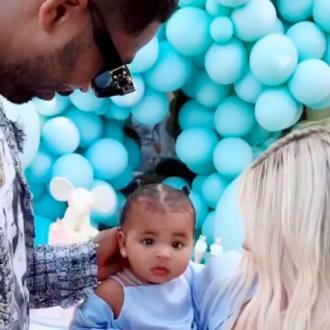 Khloe kept her social media fans updated with the progress of her baby shower (which was held at the weekend - 10 March) which included her female-strong family with her own mum, Kris Jenner, her elder sisters, mum-of-two Kourtney Kardashian and mum-of-three Kim Kardashian-West and her young siblings, Kendall Jenner and new mum and youngest sister, Kylie Jenner. The 33-year-old captioned her family-orientated snap with: "Magical moments with the most magical women! I’ll forever be in love with YOU!" Even the family’s grandmother, MJ, made an appearance at the event. Khloe is due to give birth in just a couple of weeks to her first child with basketball boyfriend, Tristen Thompson.